November 4, 1964, Graduation Day, Parris Island, South Carolina. I was 18 years old .... Geezzzz what a handsome young man ! What the hell happened to me ???? Quote #1: "I never met a magazine mechanic I liked." Quote #2: "Make sure brain is in gear before engaging mouth!" Quote #3: "If you can't run with the big dogs, stay on the porch!" Quote #4: "Go fast or go home!" At first glance, I thought I saw a chunk of 2x4 wood on your shoulder, just daring someone to come and try to knock it off. I thought they only had black and white film back then. Great picture Eddie. Cool pic, Eddie- thanks for sharing! Thanks Guys, and very funny Mike !! That was my "War Face" and yeah I thought I could conquer the world !! The color film ?? It had just been invented. My dad held the big tray of flash powder, while my mom slid the lens cover out of the camera !! Don't want to bore you all, but here I am 9 years later (1973) working 'undercover' in the PPD ! And yeah !! That's my '68 Torino in the background. The city made us use our own cars for drug buys !! Remember when Full Metal Jacket was filmed over here in the UK, they used Bassingbourn Barracks for filming the Parris Island scenes. Bassingbourn Barracks was originally RAF Bassingbourn which was where the Memphis Belle B17 was based. Like superheros...but without the powers or motivation. Thanks Mike. I wish others would post some old pics .... I have some good ones, but I don't want to be the only one posting them. Maybe we should start an "Old Picture" thread. And thank you Mike. You know why Full Metal Jacket was filmed in the UK ?? Stanley Kubrick does not fly in airplanes and didn't want to travel. The 'Vietnam War Scenes' were supposed to be Hue City right after the Tet Offensive, Jan/Feb '68. ( But it did NOT look too much like Hue or remind me of that City). Parts of the 1st Mar Div (5th Marines and the 1st Marines) were involved .... Guess they couldn't find any hot jumgle locations in the U.K. But the Parris Island Scenes were pretty close and brought back many (bad) memories !! Maybe we should start an "Old Picture" thread. 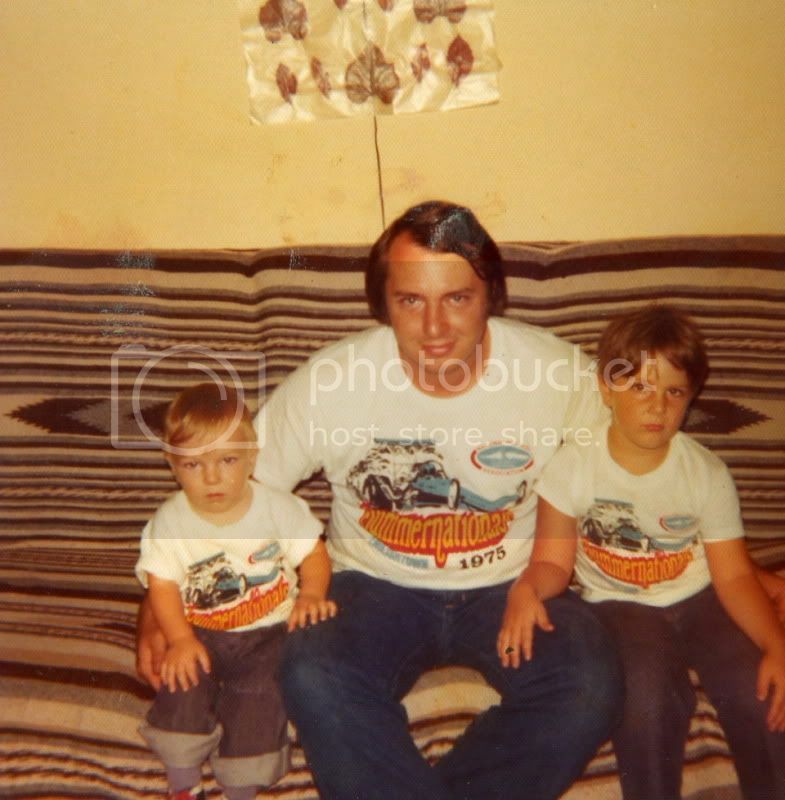 Here's one of my brother Dan, my Dad Joe Sr and me in 1975. I was 6, Dan was 1 and Dad was 26 in '75. As you can see we are sporting our NHRA Summernational tshirts that Dad got for us during his yearly trip to Englishtown, NJ for the race. We still have 'em....fortunately the couch is gone. 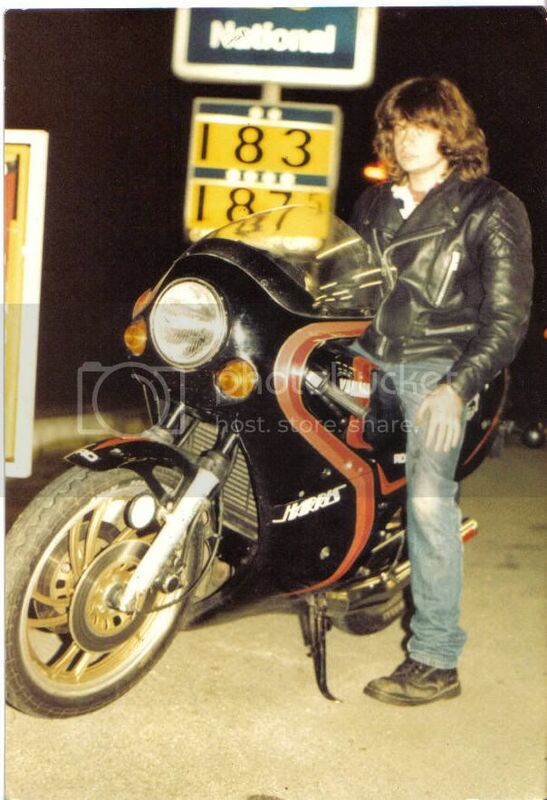 OK Ed, taken sometime in the early 80's, the fuel price is for a UK Gallon. Grippo .... I can see by your face you were a mischievous kid !! You got that look, like "Yeah I was bad, but wait 'til you see what I do next !" Mike .... you were one cool guy back in the day ! I thought all you guys drove Triumphs !! And what does the 183 compute to US Dollars/gallon ? I won't mention the HAIR ...... I'll let someone else discuss that ! Come on you other guys ...... we won't laugh at ya !!!!!!!!!!! Check out this motley crew. I'm the third from the left (with the beard). Taken in 1998 at Angel Lake in Wells, NV at Big D's shindig (car show / poker run). Still have the same amount of hair, but add maybe another 30 pounds! Last edited by Mustang Mike; 12-30-2010, 05:00 PM.